I had the opportunity to review Old Fashioned, a film based on the screenplay of Rik Swartzwelder, last week--and follow up that review by delving a little deeper into the ideas and concepts posed in the film with a novelization of Old Fashioned by Rene Gutteridge and the Old Fashioned Way Devotional by Ginger Kolbaba. I am excited to post reviews of both of these written pieces--and share the opportunity to win an Old Fashioned Prize Pack containing the film, the novelization and the devotional at the end of this post! I received complimentary copies of each of these items for use in my blog reviews. All opinions are my own. About the Old Fashioned Novelization by Rene Gutteridge--based on the screenplay by Rik Swartzwelder. By turning his back on his reckless lifestyle, former frat boy Clay Walsh has settled down to turn an antique shop in a small Midwestern college town....and to purse lofty and outdated theories on love and romance. But when Amber Hewson, a free-spirited woman with a gypsy soul, rents the apartment above his shop, Clay can't help being attracted to her spontaneous and passionate embrace of life. Amber also finds herself surprisingly drawn to Clay, but his ideas about relationships are unusual to say the least, and they bring to light her own deep wounds and fears about love. They say opposites attract, but can Clay and Amber move beyond their differences and their pasts to attempt an "old fashioned" courtship? The Old Fashioned Novelization presents deeper character stories than the film. I tend to prefer to read a book on which a movie is based rather than reading a book created from a film. In this case, I would probably recommend watching the film first so that you have no background and no pre-formed opinions. Watch the film as a love story--then dive deeper into the film's message with the novelization. The Old Fashioned Novelization is very well written and draws readers a little deeper into the characters' motivations, beliefs and the message of the film. You may not like the characters or believe in them. We are surrounded by "modern romance"--in terms of reality television, daytime "talk" shows, and popular movies and books. As a society, we are so far removed from "old fashioned" courtship and morality that the film and the novelization seem closer to science fiction to so many of us! Clay seems a little overbearing and controlling--but, much of that illustrates his unwavering belief in his views on relationships. His views are pretty extreme--and his love interest Amber willingly conforms to them. Readers will need to take a step back and recognize that, while the beliefs and messages presented in this novelization are extreme--they are going back to the basics of courtship that is simply uncommon today. Would I recommend the Old Fashioned Novelization by Rene Gutteridge? I would suggest watching the film first as the written novelization is based on the screenplay and not the reverse. If you are willing to try a different sort of "romance"--and are open to strong moral and religious convictions and a different take on modern courtship--this novelization really adds to the Old Fashioned film's message. About the Old Fashioned Way Devotional by Ginger Kolbaba. Contrary to popular opinion, being "old fashioned" doesn't mean you're dull or unromantic. In fact, a true old fashioned relationship can be more exciting and romantic than anything you've ever experienced! So what does it mean to do things the old fashioned way? Sure, it means opening doors, holding out chairs, and taking things slow. But a true old fashioned romance goes much, much deeper than that. Inspired by the motion picture Old Fashioned, this book will show you how to reclaim the lost art of romance by introducing you to romantic love as God intended it. Regardless of your past mistakes, where you've been, what you've done, or where you are now, you can find and create a love that will last a lifetime! As you work your way through this forty-day journey of inspiring readings and questions for reflection, you'll discover all the unique and amazing benefits of doing things the old fashioned way. And before you know it, you'll be well on your way to creating a love story for the ages. 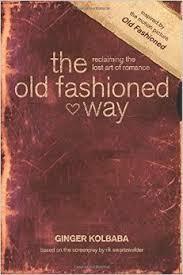 The Old Fashioned Way Devotional offers a guide to single Christians. Dating today is difficult--especially for older singles. This devotional attempts to illustrate that "old fashioned" dating is still possible--even when it goes against popular culture. The book is certainly Christian based, and offers scripture quotes, daily prayers and Christian based advice to singles on today's dating scene. Would I recommend the Old Fashioned Way Devotional by Ginger Kolbaba? As an "old married lady" with three children--the book didn't offer much for me--but, I could certainly see it as a resource offering some guidance and support for young, dating adults seeking something a little different than the bar scenes or "reality tv" dating experiences. The views presented in each of the Old Fashioned items featured here are certainly Christian and certainly presented strongly. Even if the convictions of the authors are not your own; you may find yourself interested in the strengths of character and morality they present in each work. It's always nice to see someone stand up for something personal--especially when it seems that the bulk of society has turned the other way. My hubby and I went to see X-men 3, lol. We went and saw Star Wars on our first date. We laugh about it now because neither of us are fans. My husband and I went to the movies, in April 1971, to see "Little Big Man", starring Dustin Hoffman. We went to the movie to see Fatal Attraction. I laugh about it today. We went to a local restaurant. We went on a ghost tour. My husband & I met for coffee. Since he was a friend of a friend of a friend, I didn't know much about him & didn't think I would want it to be a long date so coffee seemed like a good compromise. We ended up sitting there for hours then went to a nearby park to finish the conversation. I went to a school dance. I took my date out for pizza. We went to a restaurant called the Peddlin' Pig. The wait was long but it seemed like only minutes to us.